I’m in Portland for a couple days, visiting Beeta! Portland is cray about brunch… There’s tons of restaurants in the area that have an extensive brunch menu. Screen Door is a Southern restaurant specializing in soul food. They had tons of good reviews and praise, so we decided to check it out! We got there at around 9:30am to put our name down…and waited an hour and half to be seated!! 90 minutes!! To kill time, we walked around the neighborhood for a pre-feasting exercise to get a bigger appetite! Unfortunately, there wasn’t much to see and most of the shops were closed. There were only a few other smaller restaurants/cafes open for brunch. You can also get a cup of Stumptown coffee (refillable) while waiting to be seated. 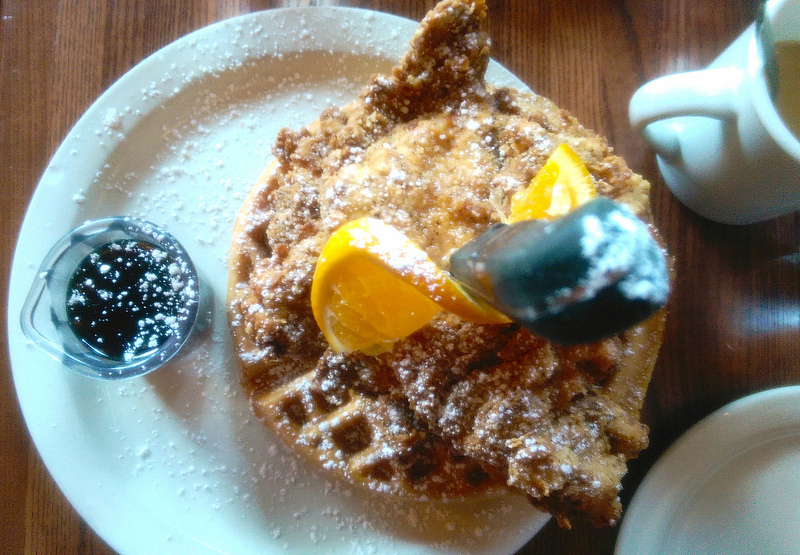 When we finally got seated at 11am, I ordered Screen Door’s specialty, the chicken and waffles! Three buttermilk battered fried chicken breasts over a sweet potato waffle. At $14.75, that is expensive…but look at how HUGE it came out to be! Three fried chicken stacked on top of a waffle, with a knife stabbed through it! The stacked chicken was as high as the coffee mug! The chicken was so good and well seasoned with a spicy kick from the black pepper. This was the best chicken and waffles I had in my life (so far). The syrup on the plate isn’t only for the waffles; you can pour it over the chicken too! Screen Door also has a bottle of homemade hot sauce in a unlabled glass bottle on the table, which went well with the fried chicken. I ended up eating half for brunch… I packed the leftovers, and reheated it in the oven for dinner. It was still good. For 2 meals, $14.75 was worth it. Screen Door, I miss you…. OHHH YESSSSS. That looks so great! Have you been to Roscoe’s in LA? Comparable? !